What Does Manual Lymphatic Drainage Feel Like? This is an excellent question and it always helps to know what to expect before you receive any type of treatment. Personally, if I don’t know, my mind is spinning trying to figure out what comes next and I never fully relax. This segment of my Manual Lymphatic Drainage Series reviews the location of the lymph nodes and what it’s like to experience the Manual Lymphatic Drainage Technique. We have lymph nodes throughout our body. All of the nodes eventually drain into two “mother nodes” located in the supraclavicular area (just above your collar bone). Working the way down the body, the next major nodes are in your armpits (axillary nodes), your cisterna chyli is located in your abdomen, and your groin (inguinal). Below is an abbreviated chart to give you a basic visual. When performing full body manual lymphatic drainage the client starts face up and the therapist starts by clearing the nodes just above your collar bone. Everything else eventually drains to this area, so you need to clear the path and give everything a place to go! 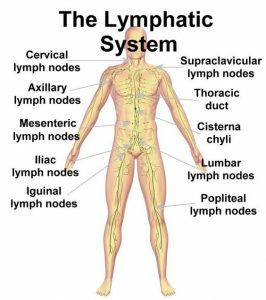 We work through the body clearing the areas closest to the nodes and working away so we are always directing the lymph to towards the cleared areas. We work through the face, scalp, and neck all the way through the front of your body before turning you over. Majority of the work is actually completed with the client face up (supine), so it can be a much more comfortable experience, especially for those who get congested easily in the face down (prone) position. The technique itself is very gentle. This is not a deep tissue massage. The lymph system is located very close to the surface of the skin, so the sensation you feel during the massage is very light pressure with a slight tug of the skin, typically in the direction of the nearest mother node (the tape playing in our heads is, “how light can I go, how far can I stretch”). There are a few areas that are massaged where you may not be used to receiving massage. 1) The eye sockets. I found it was a stranger sensation to perform this technique than to receive it. You can do it to yourself (pretty please be gentle and don’t poke out your own eye). Close your eyes, place a finger tip (preferably a clean one) on the bone UNDER your eye. Slightly roll your finger in until you feel the flat part of the bone. Yes, this helps relieve eye puffiness. 2) Your armpits. It’s a quick technique, but if you aren’t expecting someone to put their hands in your armpits it can catch you off guard. The full palm goes in your armpit, so there are no little finger tips tickling around. It’s actually kind of a comforting sensation (I find this whole treatment to be very comforting in general). 3) Under the breast. There are lots of nodes at the breast fold. The technique I use is for one hand to be on the side of the chest (kind of holding up the side of the breast tissue with my forearm and the other hand is under the breast, at the fold. Again, this felt much more invasive to perform than it did to receive. The hands barely move and the motion of the technique is towards your side and up into the armpit (to the auxillary nodes). Fun Fact: Wearing underwire bras and very tight sports bras can inhibit the full function of these nodes, which is why it’s important to clear them. It’s also important to let the girls breathe, either bra-less or with soft bras so your lymph can flow. 4) The Groin. Again, this sounded much more invasive to me than it felt when receiving the technique. The therapist’s hand is placed approximately between your hip bone and pubic bone and I always use secure draping. There’s lots of nodes in this area which is why it’s important to treat, and the therapist hangs out there for a while (about 30 seconds where other areas are about 10 seconds: one Mississippi, two Mississippi…). Please note that techniques will vary by therapist and the issue you may be having treated. These notes are based on full body manual lymphatic drainage, but if your therapist is treating a specific area for any reason, that may be the only area treated. As with all my treatments, there may be techniques I do not perform if I’m not comfortable or if you’re not comfortable. It’s all about communication. In addition to providing a stand alone lymphatic drainage massage, I will be adding this technique to select areas of the body during my Integrative and Ashiatsu massage sessions at no additional charge. Typically these will be areas that require extra attention or deeper work and the lymphatic drainage techniques will help minimize inflammation in those areas.